July 17, 2009 CBC Television Toronto News at Six. See the clip here. 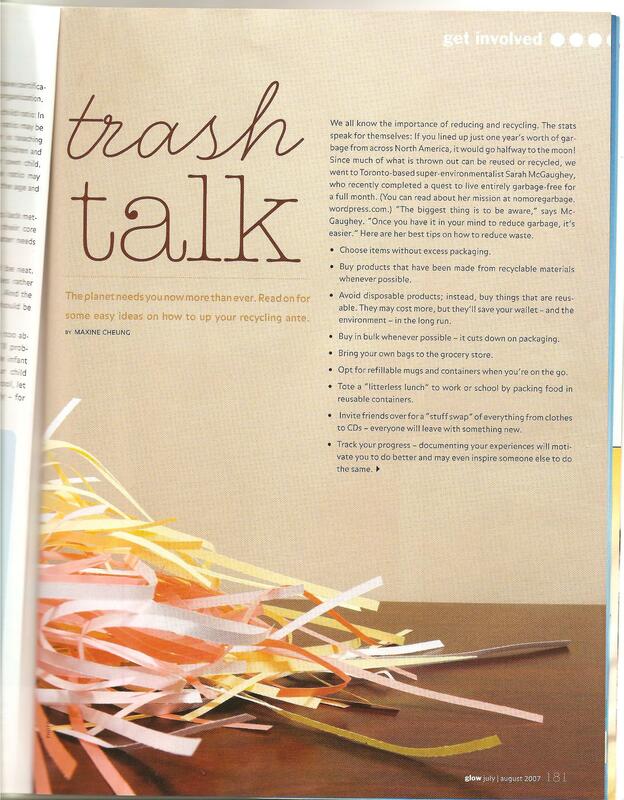 June/July: Todays Parent, how to Green your Home issue. June 10th, 2pm: Colborne Lodge in High Park (Toronto). Public speech on the garbage project. All are welcome. Gord Perks(city Counciller and Author of the Green Consumers Guide) will also be making an appearance. Tuesday February 13th, 7:45am Canada A.M, channel 8, CTV. Both Kyle and I ! Thursday January 25, 4pm (ET) CBC NewsWorld. * I have this one recorded but I don’t know how to put it up, so if you want to hear it, let me know and I will email it to you. Monday January 22nd, 11am-12pm and again at 2pm-3pm, I will be on the Gillian Deacon Show on CBC television, channel 6. Actually I will be there on Wednesday and the camera crew is coming over to our home tomorrow, but it airs Wednesday so that’s when you can watch it. Garbage, trash, waste, litter—whatever you call it, there’s no denying that it’s everywhere. Almost everything we use creates trash, from convenient individually wrapped snacks to children’s toys enclosed in layers of plastic. Consider the amount of trash you create preparing just one meal. What if you cut all that extra packaging out of the equation? Is it possible to eliminate trash from our lives? Toronto couple Sarah McGaughey and Kyle Glover took on that challenge. Beginning in 2004, they attempted to go thirty-one days in a row without making any garbage. They also launched a blog (nomoregarbage.wordpress.com) to track their progress. The project proved to be very difficult, and their record was only twelve trash-free days in a row. But, it should be noted that they filled just two large trash bags during their two-year effort. The duo then took a yearlong break to research better ways of accomplishing their task. This year, McGaughey and Glover relaunched the project. McGaughey achieved thirty-one days trash-free on February 23, and Glover on March 2. Urbanite talked to McGaughey in May about the project, how her pregnancy affected its outcome, and the couple’s plans for the future. Q: What does it take to cut out trash? You can’t participate in the culture of convenience at all. You have to have everything pre-planned or it doesn’t work. On an average shopping day, I would start getting ready about 9 in the morning. I put together a backpack full of bags. We did reuse plastic bags and I also made some bags out of a material like the one that is used for wind pants. So I would get together all the bags and all the containers and hop on my bike. we could get cheese with absolutely no packaging, for example. It’s about a half-hour ride there, and shopping would take two hours. I’d go to the front first and weigh the containers, and then I could fill them with whatever I needed. Containers were usually for things like maple syrup or peanut butter and things like that. We did the same thing for cleaning products—there was a place we could get cleaning products in bulk. By the end I’d have a full, pretty heavy backpack. I’d bike home and put everything away. It’s quite a chore and a lot of people couldn’t imagine doing it. But I kind of enjoy it; it’s a nicer shopping experience than going to a big store, although it definitely takes longer. Q: Do you think that you would have had a much harder time doing the project if places like the market weren’t nearby? I think those places always exist; you just have to find them. That’s why we were able to do it after three years. We had all that time to do research. Q: So this project became like a full-time job, in a way. I have a background in art—I went to school for fine art. I picked this up as a performance art project. It’s like the “artist’s life” kind of project. In this kind of project, you don’t necessarily have a product, but sometimes you do (in my case there’s the blog and photographs), but mostly it was the action of accomplishing something in your life. Often it’s something extreme. The idea of the extreme—absolute zero—was more performance art than it was an environmental project, because it didn’t make the most sense environmentally. I wouldn’t necessarily recommend that people do it to the extreme except for the learning experience, because there are some parts of being so extreme that are not necessarily the best answer for the environment. For example, the company we got organic milk from is an awesome family-run company that does a lot of good for the environment. But we had to stop getting our organic milk in glass bottles because of the small plastic safety tab on the top. So instead we made rice milk and almond milk, but you can’t grow almonds or rice in Canada, so that had to be shipped. That was a problem. Q: What difference did your pregnancy partway through the project make? How did you adjust your expectations? I changed the rules. We’d gone the longest ever with no garbage. Suddenly I had a cotton ball, a needle, and a Band-Aid, and all the things from the pregnancy test, and I was going to need anti-nausea pills that came with a little safety seal. Completing the project was going to be impossible. Either I can start over at day one, or I can change the rules. So I decided to change the rules and I allowed an exception for medical garbage. Also, when I became pregnant, I was extremely sick. I was vomiting all the time. People suggested soda crackers and PowerAde, but I couldn’t do it because of the packaging. We attempted to make our own soda crackers but it wasn’t the same. People think it will be really hard to do once we have the baby. We realize that we will have less time when the baby comes and are trying to do as much preparation as possible so that we can make as little garbage as possible, despite being busy and sleep-deprived. Q: What did you do about menstrual products, toilet paper, and the like? Q: What conclusions have you drawn? In our society right now it’s almost impossible to be garbage-free because of the way we’re set up. Some large things would have to change at the top—the way things are manufactured, the way we buy things. And there has to be balance to everything. Everything’s connected, so when you’re thinking about the environment you really have to think of every aspect rather than just the garbage. In order to be garbage-free and more environmentally friendly I found I ended up going a lot more grassroots. I realized that if I buy stuff locally and know the person who makes it or grows it, then I can get garbage -free products that are also organic or environmentally friendly in some other way. Q: What kind of criticism have you heard? If we did end up with garbage during the first two years, we would try to make it into artwork to give it another life. For example, small stickers on fruit—we incorporated them into collages and greeting cards we create. People would read about that in the articles written about us, and they would get the impression that we were just handing off our garbage. But the second time around, this January, we decided that even if it had another life it was still considered garbage. So our goal became to try to make absolutely zero trash. Another thing was that some people said that because we were so green we were actually hurting the environmental movement, that people would look and say, “In order to be an environmentalist, I have to be a freak like these people.” But we just continued because this was something we were doing for ourselves. Other people didn’t have to do it. We plan to continue to reduce [filling one small bag of garbage every three weeks] and we are saving money to buy land and build a sustainable cobb home in the country somewhere. We don’t have any plans to do zero garbage again until that dream has been realized. Q: What can you recommend to others who might want to follow your example? Doing this project made us aware of how much garbage we actually make. If you did a garbage inventory, like the way you keep track of your money to do a budget, that would be really helpful. Choose a length of time, perhaps a week, and record every piece of trash, whether in a notebook, on a blog, or with photos. There are lots of little things you can do to be prepared ahead of time, like having cloth bags in your backpack or your car. There’s not really a need to take a plastic grocery bag ever. If you can do stuff like have reusable things instead of disposable—I use a handkerchief, for example. I know not everyone is into that; some people think it’s gross. But any little change that you’re comfortable with helps a lot. —Marianne Amoss is Urbanite’s managing editor. What if the city’s garbage trucks pulled up to our houses and found all the trash cans empty?While this situation is unlikely to be realized at any point in the near or even distant future, at least two families are attempting to get to the point where they are throwing out zero garbage.This newspaper has featured attempts by Beach resident Karen Buck to get her family to produce no trash. They now throw out only about five or six garbage bags in a 12-month period. She is diligent. She tries to buy clothes that have biodegradable fibres and products that can be repaired, and to donate used products to Goodwill. She also keeps separate containers (for blue and green bins) throughout the house so nothing recyclable gets mixed in with regular trash. Another couple, Sarah McGaughey and Kyle Glover, are attempting to throw out no more than one small shopping bag of waste every two weeks, but want to reduce this to zero waste. Click here to find out more about the Oakwood and St. Clair area couple’s process. These families inspired me to give zero waste a try. I decided to conduct a test and report my discoveries here, but with the deadline looming I had only two days to do a trial. My first test was when I ordered hot chocolate in the cafeteria at our offices. I asked for a mug and spoon to avoid using a plastic stir stick and paper cup, which I was not sure were recyclable. The café owner was going to measure the milk in a paper cup, but I stopped him, explaining that since the cup would then be thrown out, this would defeat the purpose. For several weeks I have been packing my own lunch rather than buying it from local eateries. The benefits are saving money, greater say over what I eat and more control over the amount of waste and packaging I use. I have a reusable vinyl lunch bag and package my salads, stews and soups in reusable plastic containers and bring my own cutlery. During the two days of the test I brought fruit, sandwiches and granola bars for snacks. But by day one I had messed up. I had two fruit stickers (with product codes) that came on the apple and grapefruit I took for lunch. The granola bars I brought (purchased before this test) came in a recyclable paper box, but were individually wrapped in plastic packaging that had foil on the inside. I looked on the city’s website to see if this packaging could go in the blue box. It was not listed. I cross-referenced using a list of non-recylable products that the Town Crier got from the city when we did our series on garbage. Under the packaging heading I saw foil wrappers, so I threw out the granola wrapper. At home, I had to throw out the large plastic packaging that the toilet paper came in. In the future, I will try to find granola bars and toilet paper that come in recyclable packaging. While I could live without granola if there is none available in a recyclable wrapper, I am not ready to resort to using leaves instead of toilet paper — so here’s hoping there is some environmental packaging out there! One of my worst habits is the use of plastic bags — the clear kind you put your grocery fruit in. I use them to wrap my tupperware of soup, in case of spillage, and for pickles and orange wedges. I could not bring myself to throw these out afterwards so I washed out each one and tossed the orange peels, used tissues and paper towels into my green bin when I got home (as there are no such facilities at work). At an evening community meeting, I had two small chocolate cookies and water in a recyclable cup. I did not make any purchases in the two days that could not be fully recycled. In the end, I still threw out toilet paper packaging, two fruit stickers and a granola bar wrapper. But my quest has sparked a desire to be more conscious about whether what I buy comes with a zero-waste promise. With some careful planning and research I hope to find some alternatives, but I am skeptical of reaching a zero-waste goal. What of toothpaste, bread and frozen peas? They all come in plastic tubing or bags. If there are no alternatives, maybe this is nature’s way of telling me to resort to the old days, when we used baking soda and water for cleaning our teeth, got bread from the bakery in paper bags and bought fresh peas still in the pod, not frozen in a bag. Please email me any environmental tips, ideas, suggestions and success stories you have. Saturdays (starting January 23rd 2007) in the Globe and Mail, Toronto edition, Dale Duncan has an article tracking our progress. Scroll down, I’ve posted it here weekly. Here’s the article that started the ball rolling! Thanks Dale Duncan and the Globe and Mail! Sarah McGaughey loves to talk trash. While the rest of us try to go to the gym more often, her resolution for 2007 is to make absolutely no household waste — and she and her husband, Kyle Glover, might just pull it off. Considering Mayor David Miller’s re-election pledge to cut the amount Torontonians send to the landfill by 70 per cent, the difficulties the couple face in reducing their garbage suggests some of the things that need to change if we’re really serious about cutting waste. The couple recycles as a last resort to avoid sending trash to the landfill — but they’re most committed to reducing waste, and the obstacles can be surprising. “Our biggest problems are the smallest things, like stickers on fruit,” says Ms. McGaughey, who saves those stickers to make collages and cards for friends. In a city where the average household generates a tonne of waste a year, it’s nearly impossible to reduce waste down to the last sticker. So the couple have put out a call on the website craigslist for others to join them with waste-reduction projects of their own. Their aim, Ms. McGaughey says, is to build a network of support where people can share tips for reaching their goals. But the main idea is simple: Avoid buying any packaged goods in the first place. The couple made the decision to limit their waste after spending time in Korea, where Ms. McGaughey was teaching English. The language barrier made asking for items difficult, so they ended up buying a lot of pre-packaged goods. “One day, we created so much trash, it just struck me,” explains Mr. Glover, 32. “I thought, when I got back, I would try a whole month of making no garbage. After three months, I kind of gave up, but Sarah didn’t.” Ms. McGaughey only grew more enthusiastic. “In November of 2004, I said, ‘Okay, let’s try again, totally hard-core,’ ” she says. The couple’s commitment is all-encompassing. In their cozy apartment near St. Clair and Oakwood, newly washed plastic bags attached to a fan in the kitchen dry in the wind. She figures she’ll start making her own rice milk and almond milk again, since the refillable milk bottles they order from a health-food store are sealed with disposable plastic tops. And though the husband and wife team enjoys music (they perform in a band called Push Buttons), they’ll have to refrain from buying plastic-wrapped CDs. Katrina Miller, co-executive director of the Toronto Environmental Alliance, says that even if the couple never reaches their zero-trash goal, simply aiming for it is a wonderful idea. “Everyone knows people who are trying to get into the habit of coming home after every shopping trip with less packaging,” says Ms. Miller, who has worked on waste policy for the advocacy organization for the past seven years. “They usually come home frustrated. In the reality of everyday life, the options are few.” And despite Toronto’s recent purchase of the Green Lane landfill near St. Thomas, Ont., there is a shortage of disposal options in Central Ontario, Ms. Miller says. “If we don’t do something, we’re going to have garbage crisis after garbage crisis after garbage crisis. We need to make smart consumer choices.” Ms. McGaughey, 29, says she spent much of 2006 researching places to shop for package-free goods, knowledge that will come in handy for the year ahead. When trying to avoid packaging, one-stop shopping is not an option. The couple buy food in bulk, using their own containers and cloth bags. Going without plastic, however, was tough. Bulky containers were difficult to carry and often leaked when travelling on foot or by bike. Plastic bags are more malleable, and can be wrapped around containers to prevent messes. The couple wash and reuse each bag until it begins to deteriorate, a process that can take up to three months. One of the biggest challenges for Ms. McGaughey has been getting people in stores to realize that she wants to make garbage-free purchases. Drinks should be straw-free. A single muffin should go directly from the tongs of the counter attendant to her hands — no napkins required. “I often end up just looking really crazy,” Ms. McGaughey admits, describing the weird looks shop attendants give her in response to her requests. Ms. McGaughey, who works at the Colborne Lodge museum in High Park, has been documenting their experience on her daily blog (nomoregarbage.wordpress.com) in hopes of invigorating others to cut back the trash they produce. Her advice for others wanting to go garbage-free: No. 1, carry a “survival kit” containing Tupperware containers, a handkerchief, a travel mug, some plastic bags and a shopping bag. No. 2, figure out your vices and then find a way to get them without creating any trash. Introducing Globe Toronto’s weekly look at Sarah McGaughey and Kyle Glover, a Toronto couple working to generate zero garbage in 2007. Composting is painless when it comes to potato peels, but there are some natural substances you don’t want hanging around your apartment. Take ear wax. To avoid sending Q-Tips to the landfill, Ms. McGaughey buys biodegradable ear cleaners, which are made of tightly wound cardboard instead of plastic. Even these are off limits in Toronto green bins, however, so Ms. McGaughey cuts them up into small pieces (to aid biodegradation) and puts them in the compost. “If I’m really on the ball, I unwind the paper,” she says. In preparing for a trash-free bathroom, neither Ms. McGaughey nor Mr. Glover was willing to switch to a straight razor, which can be sharpened again and again. “I’m too accident-prone for that,” Ms. McGaughey says. Instead, Mr. Glover purchased an electric razor, and Ms. McGaughey is using a razor with a changeable blade, stretching out its use as long as she can. They are, however, trying to make their own toothpaste — er, toothpowder: three parts baking soda, one part salt. Their toilet paper comes in recycled paper packaging, which the couple will reuse as wrapping paper. And if someone gets a boo-boo? “We’ll try not to cut ourselves,” Ms. McGaughey says. 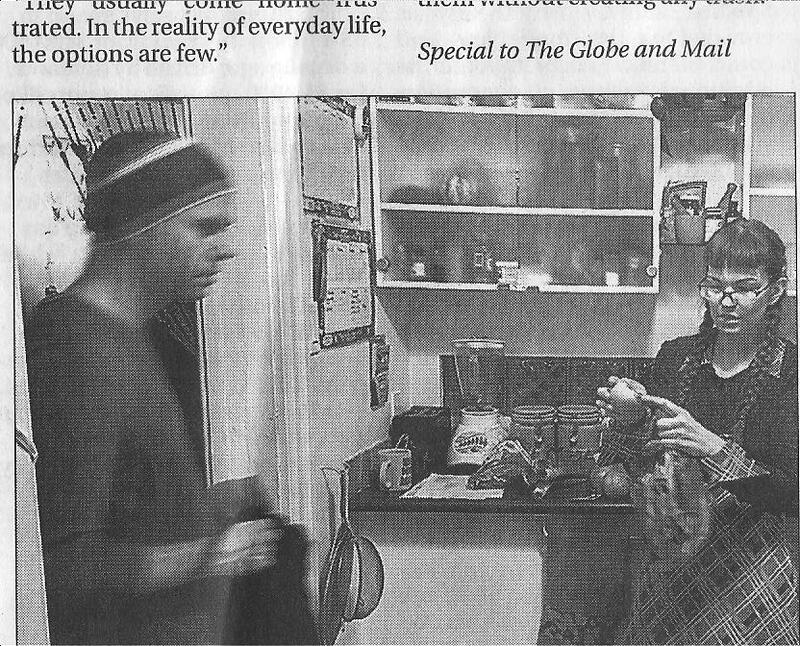 Globe Toronto’s regular look at Sarah McGaughey and Kyle Glover, a Toronto couple working to generate zero garbage in 2007. Ms. McGaughey and Mr. Glover left for Montreal this week expecting to get some rest and relaxation while staying with friends. But travelling isn’t easy when you’re trying to live trash-free — if anything, it has made the couple realize just how much they’ve come to depend on certain people, places and programs back home. In Toronto, the couple shop at places such as Cheese Magic in Kensington Market. At first, the deli staff would hand Ms. McGaughey her cheese in waxed paper. On a later visit, she asked if they would use a bag she had brought from home, explaining that she didn’t mind if they touched it. “The manager said that they weren’t allowed to touch it with their hands, but they can touch it with my bag, so they pick it up with that,” she says. Ms. McGaughey and Mr. Glover have also come to depend on the farmers’ market at Dufferin Grove Park, where they can buy fruit with no stickers, bring their own containers for eggs and get refills of olive oil from a big steel vat. An egg farmer there encourages customers to return used egg cartons. Sarah McGaughey and Kyle Glover, a Toronto couple working to generate zero garbage in 2007. No matter how hard you try, you won’t always have control over the waste you make. That’s definitely true in the workplace, says Ms. McGaughey, who works as a tour guide at Colborne Lodge in High Park. One week, her job was to help schoolchildren make toffee. Problem No. 1: The candy was placed on wax paper to dry. Problem No. 2: Ms. McGaughey had to give the children paper towels to wipe their buttery hands. Unfortunately, the used tissues couldn’t go in Colborne Lodge’s compost, since it’s outdoors and would attract animals. And the lodge (despite being a city-run museum) isn’t equipped with a green bin. Feeling partly responsible, Ms. McGaughey lugged a large garbage bag of the buttery paper towels home on the subway to dispose of in her own green bin, where meat and dairy products are welcome. Visiting friends and family also comes with risks. “I babysit for my sister once a week. If I’m there for dinner, she’ll often take things out of their packaging before I get there,” Ms. McGaughey says, adding that this doesn’t meet her standards. Since the couple made the decision to “go hard-core,” they’ve encouraged friends and family to be more conscientious. And don’t get Ms. McGaughey started on bars and restaurants. She will sometimes drink tap water with her hands rather than order from the bar. Just because you order a drink without a straw, she says, doesn’t mean your server won’t bring you one. When Ms. McGaughey and Mr. Glover decided to try to make zero garbage, they didn’t factor a pregnancy test into the mix. It’s impossible to buy a pregnancy test free of packaging, and the test itself — which contains a coloured strip that tells you whether or not you’re pregnant — goes directly in the trash. “How can I reuse a plastic stick that has my urine on it?” Ms. McGaughey says. The first obstacle: “I’m very, very sick,” Ms. McGaughey says. “Morning sickness isn’t just in the morning.” Mr. Glover has been making trips to the convenience stores for bottles of ginger ale, which calms his wife’s upset stomach. Unfortunately, the empty plastic bottles, though recyclable, don’t calm Ms. McGaughey’s conscience. She has decided to find stores that sell ginger ale from a fountain so she can buy the beverage using her own reusable cup. I just wanted to say hi and let you know that we (stacey and I) are parents now too. Among other reduction and conservation projects we are trying to go diaperless as well. we would like to hear from you so send us a message. Inspite of many views, good researched articles still fetch in reviewers like me. You demonstrated broad understanding of the issue matter and my thoughts are now complete after reading your post. Please preserve up the effective work and i will subscribe to your rss feed to be advised of any inflowing postings.